So Cisco announced today that they will now have a “Cisco Certified Architect” certification, which is specifically stated as being higher than the CCIE.Â You have to have a valid CCIE and a valid CCDE to go for the title.Â What are your thoughts everybody? I myself am pretty disheartened by this news.Â I mean, here I am having worked my entire career to get to the CCIE level.Â I just got my CCIE and now there is going to be something “better”?? ?Â I mean, how much more do we need Cisco? 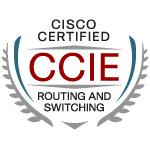 Maybe it is time to throw in the towel and realize you will never get everything because there is a new cert every day.Â Look in the last year we have already seen CCIE wireless, CCDE, and now CCA. I’d like to hear from other people out there what your thoughts are on this announcement. I just posted this over on the IPexpert OSL form in response to a student question.Â It actually threw me for a second, and I thought it would be a good thing to post out there for everybody! R1#sh ip route | i 10. R2#sh ip route | i 10. What we see on R1 is that it has a directly connected route, 10.1.1.1/32. R2 has a directly connected route of 10.2.2.2/32.Â R2 summarizes this /32 route as well to 10.0.0.0/8 and sends it to R1 with a metric of 1.Â When R1 receives the route, it has now learned about the route 10.0.0.0/8 via its fa0/0 interface with a metric of 1. Here is the trick — I know it looks insane at first — R2 gets 10.0.0.0/8 and then sends out 10.0.0.0/8 out the same interface appearing to violate the split horizon rule as you said.Â BUT what you have to see here is that when R2 sends out 10.0.0.0/8 it is NOT sending out the 10.0.0.0/8 route it learned from R1 — instead it is sending its own summary of its own /32 loopback 10.2.2.2/32. Well, I used to post about the Blended LEARNING Solution from IPexpert, but nowadays I am making more coffee : )Â So, I love Dunkin Donuts coffee!Â I freaking love it…I usually get a large coffee from there in the morning.Â I had started to realize a while ago that each and every time I went there and ordered a large coffee with “cream and sugar” it tasted EXACTLY the same.Â They must have some exact measurement of cream and sugar they put in a large coffee. So I asked my local DD manager, and sure enough they put “4 sugar and 4 cream” in a large coffee.Â I purchased a pound of their grind and went to work on the ultimate home brew solution.Â In the past when I purchased coffee and brewed at home, it just never came out tasting the same as at the store.Â My goal was to brew the perfect DD coffee and to have it taste exactly as if I had purchased it across the street. I started with the packaging of the coffee itself, which was very useful:Â “2 Tablespoons of coffee per 6oz. of fresh cold water”.Â Simple enough.Â Knowing that 8oz. = 1 cup, I took out my measuring cup and put in 2.5 cups (20 oz) of water into my coffee maker.Â So 20 oz. / 6 = 3.33.Â 3.33 * 2 = 6.66 … I rounded it down and put in 6 even Tablespoons of grind. My next goal was to figure out roughly how much sugar is in a common “packet.”Â google revealed that a Mcdonald’s sugar packet is “4 grams” which google also revealed is equavalent to about .56 oz or 1.13 Tablespoons.Â Since I have a Tablespoon measuring widget, I opted for 1 Tablespoon per packet.Â I went ahead and added in 3.5 Tablespoons of sugar…I cut it just a tad short because I realized that I shorted on the water…I wanted 20oz of actual coffee, and some of the water gets lost in the brewing process.Â I figured a cream would be about the same, so I put in 3.5 Tablespoons of cream. It is starting to feel like crunch time with Cisco Live coming up along with Narbik’s camp next month. I have finished all of IPexperts Vol 2 labs, and everything I have for Narbik’s camp to work on including Soup to Nuts. I am hoping the workbooks for the July date ship out soon so I have them for when I return from Cisco Live. I decided to opt out of the August Glendale camp since I was thinking of trying for a lab spot in late August or September. I am just getting nervous about the lab cut over date to the new version come October. I would like to have time to retake the lab if need be instead of a one time only deal :). Not sure if that is going to be an option though. Maybe I am just better off keeping my current date still and spending a week with Jared @ IPexpert and then hitting the lab. Everything I hear about his camp is extremely positive. Would hate to miss the opportunity. I am feeling a lot more confident in my core areas than I did a few months ago. IPexeperts WB II helped a ton in that area. I know all this is going to be humbled once I spend the week with Narbik. Atleast I am feeling confident right now. Plus I can’t count out the class time I have over at Cisco Live starting this Sunday. One day of lecture and one day of lab time I know is such a small amount of time to try to cram in any of the material, but it still can’t hurt right? New Yahoo Datacenter 15 Minutes From My House? Would my web searches be faster ;)? The LAN switching guide has finally received a well deserved update. You can pre-order this as of today. Release date is June 24th. I am hoping they have copies of it stocked at the Cisco store at Live I can pick up! Cisco LAN Switching Configuration Handbook, Second Edition, is a quick and portable reference guide to the most commonly used features that can be configured on CiscoÂ® CatalystÂ® switches. Written to be used across all Catalyst IOS platforms, the book covers general use of Cisco IOSÂ®, followed by a series of chapters that provide design and configuration guidelines. Each chapter starts with common design overviews and then describes the configuration of management features. Coverage includes Layer 2, Layer 3, multicast, high availability, and traffic management configurations.